It is quite obvious that something is not very right with the way the Department of Occupational Health and Safety (DOSH) and all related construction authorities are monitoring work safety at construction sites. There have been quite a number of tragic and non-tragic incidents at construction sites recently and yet accidents continue to recur despite DOSH’s claims that it has set up safety committees to tighten inspections. 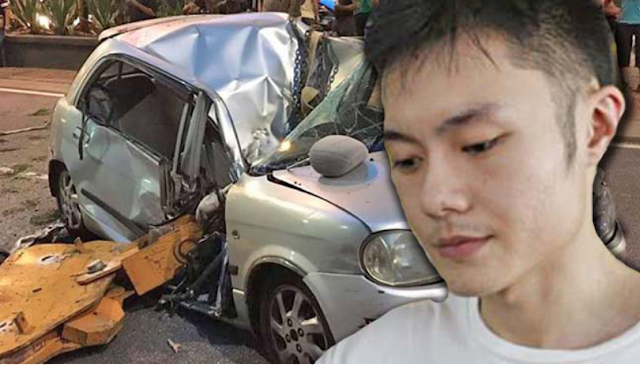 Gerakan Deputy Speaker Syed Abdul Razak Alsagoff said: “There was the woman who was crushed to death by a crane hook that fell on her Perodua Kelisa from 20 storeys up. 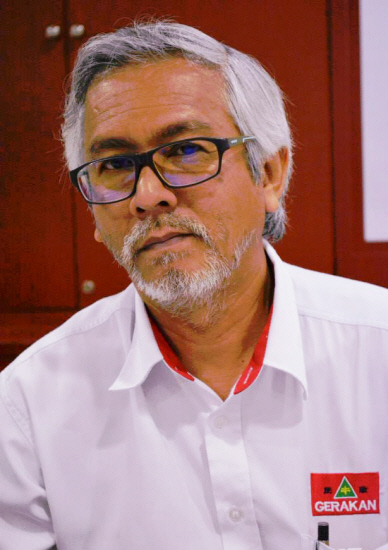 Syed Razak said such tragic and non-tragic mishaps at construction would not occur or could have been avoided if high and competent construction work standards had been observed. “Stop-work orders should be slapped on developers at such sites of mishaps. 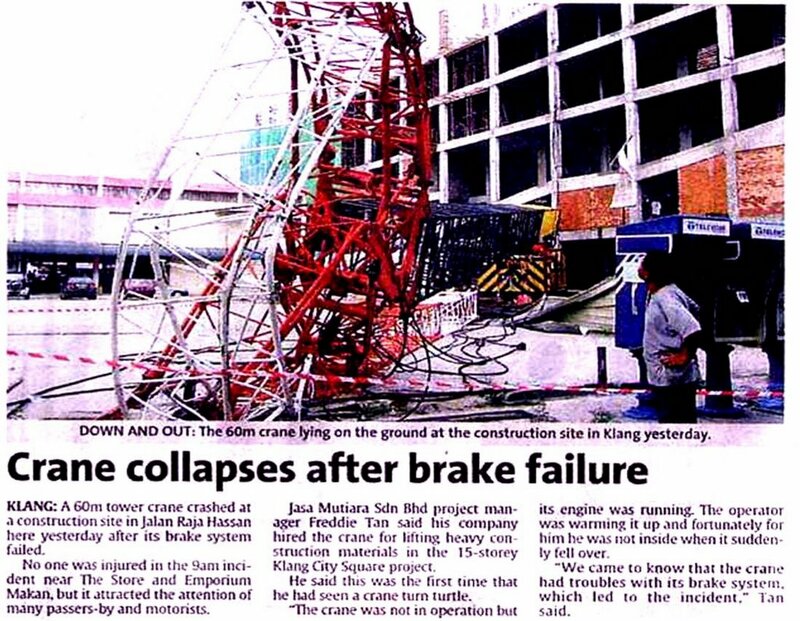 Although no one was injured in the collapse at the BDP site, still it is worrying. “Something must have gone very wrong when a crane can just topple over just like that. Obviously, this must be due to incompetent construction work in progress,” he added. 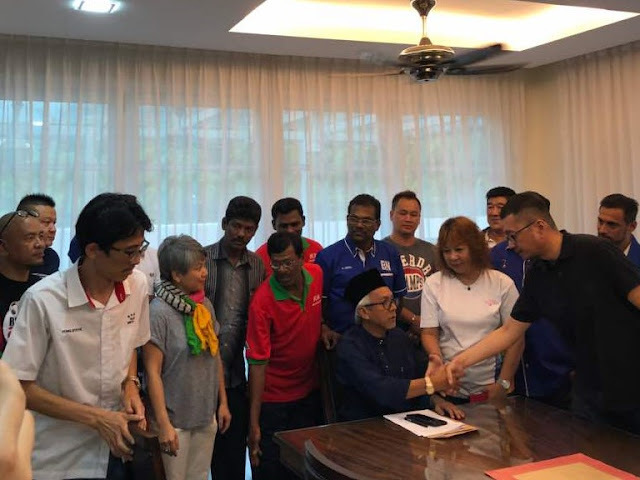 Syed Razak, who is Gerakan’s nominee to contest N.37 Bukit Lanjan as Barisan Nasional (BN)’s candidate in the coming 14th General Election (GE14), said “stop-work orders should be slapped on developers to facilitate investigations to identify work safety weaknesses and corrected before construction work can be allowed to resume”. “It does not matter whether the mishap has resulted in death or not. No death does not mean all is okay. DOSH and all construction authorities must buck up, take stern action to show they really mean business. “This will ensure that developers are always alert and observe strictly to safety regulations and precautions to avoid the inconvenience of stop-work orders. “This will also remind them about the folly of cutting cost and quality, thus compromising work safety at construction sites,” he added. PETALING JAYA: A crane has collapsed at a Bandar Damansara Perdana construction site on Monday. Selangor Fire and Rescue Department assistant director (operations) Mohd Sani Harul confirmed the incident, saying that the accident happened at a construction site located in front of the LHDN building at Empire Bandar Damansara Perdana. He added that the department received the call at about 2pm. “Five personnel were dispatched to the scene. No one was injured during the incident,” said Mohd Sani. Earlier, an image of an overturned crane at a construction site in Damansara has been posted up on social media by a motorist. "I was near the PJ Trade Centre. This was opposite the Trade Centre, across the highway. I believe that this is a new development," he said when contacted. He verified that the image is real and said that he took the photo at about 2pm on Monday. The image posted by the motorist shows a crane hanging upside down on a high-rise building, and it appears to be attached to the back of a trailer. Family, relatives and friends bid final farewell to Joice Chin, 24, in George Town yesterday. 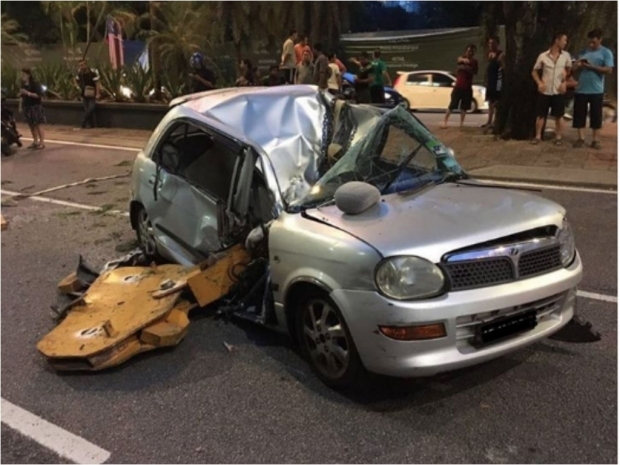 PETALING JAYA: The family of the young woman who was killed in a freak accident in Kuala Lumpur last week are still debating if they should take legal action against those responsible for her death, Malay Mail Online (MMO) reported today. The victim, Joice Chin Khoon Sing’s older brother, Khoon Ying, said this to reporters after the funeral in her hometown, George Town, Penang yesterday. “We will have a meeting tonight (yesterday) to decide whether to proceed with legal action. We want to take a collective stand before deciding what to do,” he was quoted as saying by the news portal. In the incident last Thursday, Khoon Sing, 24, was killed instantly when a crane hook fell on her Perodua Kelisa from 20 storeys up. Her car was stuck in a traffic jam on Jalan Raja Chulan at the time of the incident, which occurred at about 7.15pm. The administration executive, who worked in Puchong, was on her way to join her family and was able to send out a message via WhatsApp, minutes before the incident, to say that she would be late for the appointment. At the funeral, the tears flowed freely over the great loss for the family and close relatives. It was a sombre moment for all who came to pay their last respects at the family home yesterday morning and later at the Batu Gantang crematorium, where her mother Yeoh Ang Hooi, 58, Khoon Ying, and a cousin who was close to the victim, were seen weeping uncontrollably. Various government agencies are involved in investigating the accident. It was reported that the police and Department of Occupational Health and Safety (DOSH) are probing, especially the identity of the crane driver, who fled after the accident and is still missing. 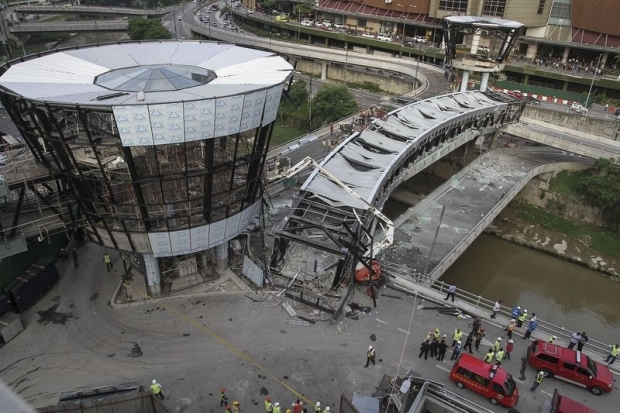 KUALA LUMPUR, Nov 30 ― SP Setia Berhad, the developer of the up-and-coming KL Eco City has confirmed that one worker died today in the collapse of a pedestrian bridge under construction at the site. The bridge was to link its project to the Gardens shopping mall at Mid Valley here. “SP Setia confirms that an incident had occurred at the Abdullah Hukum project site. Approximately 3.30pm, the pedestrian link to Mid Valley which is still under construction gave way. “The project team is still assessing the situation and is working closely with the relevant authorities. The number of casualties is still being determined. As of the statement release time, one worker died,” it said in a short statement to Malay Mail Online. SP Setia said it deeply regretted the incident, but is unable to provide further details as investigations are ongoing. According to Kuala Lumpur Fire and Rescue department chief operations officer Samsol Maarif Saibani earlier, five people have been injured, three whom were reportedly in critical condition. In a preliminary report, Shamsol said three victims have been sent to the Universiti Malaya Medical Centre for treatment. On its website, KL Eco City is described as a “world class city-within-a city” on 25-acres of prime land and is a mixed development of commercial, retail space and luxury residential property. - malaymail online"